The most popular on-field helmet design is now offered as a Replica display helmet. Medium size Speed shell with the same facemask and 4-point chinstrap as the authentic version. Includes a non wear plate and molded foam jaw pads. Not to be used for play. Approx. 9.5" tall. Fans of just about any age can now show their loyalty by displaying a Riddell collectible helmet in sizes and price categories that fit every fan's needs. From pocket size collections to full-size authentics, current and throwback, individually and in sets, we pride ourselves on offering everything a collector might dream to own. Our helmets are used extensively by autograph collectors to showcase their favorite athlete's autograph. Whether it's on a mini, deluxe replica, or authentic helmet, a star player's autograph will shine best when it's on a Riddell collectible. This helmet is for display only. It is not intended to be worn or used as a protective helmet. FREE USA flag decal for back of helmet, exclusively from THE SPEEDY CHEETAH! A full size replica of what the players wear on the field! 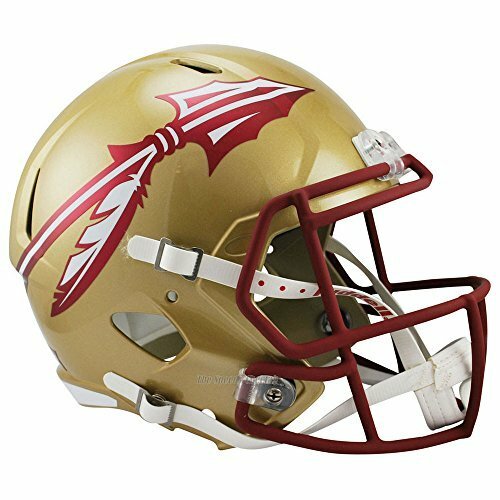 Officially licensed NCAA helmet including your team's colors and logo. True-Curve aggressive ABS shell, steel polyvinyl-coated facemask, 4-pt chin strap & molded jaw pads. Helmet sold for display only. View More In Football Equipment. If you have any questions about this product by Riddell, contact us by completing and submitting the form below. If you are looking for a specif part number, please include it with your message.